The official first day of summer is still a week away on June 21, but temperatures in the Valley are already on the rise and will only continue to intensify over the next few months, making a fully-functioning home cooling system a necessity. While HVAC checkups are recommended twice a year, especially when temperatures change, that’s not always feasible for some Arizona residents. Many homeowners are unable to perform the regular maintenance required to keep a well-running unit and often don’t realize there is an issue until it is severely damaged. On Wednesday, June 6, several of our students applied their recent knowledge to give one deserving family a complimentary HVAC tune-up. Luz Camou, a homeowner and single mother, hadn’t been able to service her HVAC unit in more than three years. She was identified through RSI’s partnership with local nonprofit Friendly House. “This activation offered our students an exciting opportunity to not only help a deserving family in our community, but also leverage the skills they’ve acquired while at RSI as they prepare to enter the workforce,” said David Eaker, Campus President at RSI. Three students, along with David Heiman, one of RSI’s lead instructors, repaired Luz’s home unit just in time for the triple-digit heat. In addition to donating time and materials, RSI gifted the family several items to help them beat the heat this summer, including reusable stainless-steel water bottles, a cooler, a Walmart gift card and an AMC movie theater gift card. RSI also supplied Luz with a six-month supply of air filters and a can of hairspray to help capture more air particles in the filter. Friendly House is a multi-service organization that focuses on education, workforce development, family services and immigration. 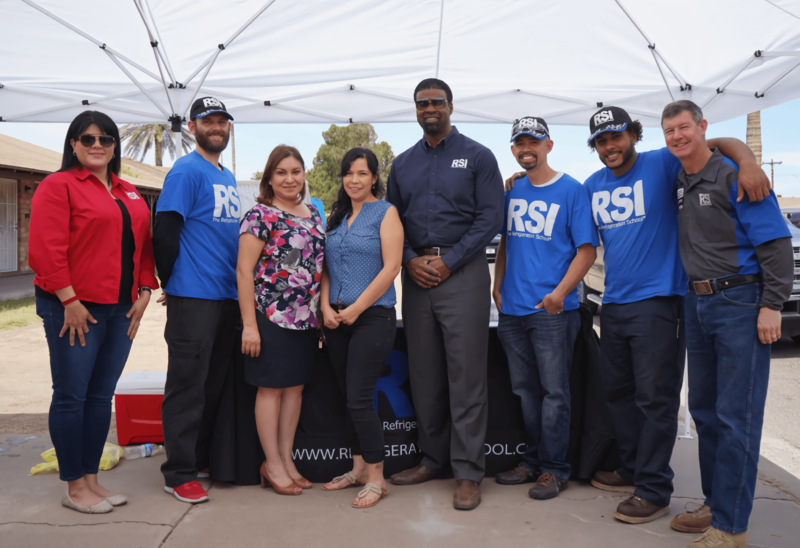 RSI partners with Friendly House to train individuals in skilled trades.